Recently we have supplied a French client with 220 pieces of titanium grade 2 seamless tube size of 19.05 mm(o.d) x 1.25 mm(w.t) x 3000 mm (length). These commercially pure titanium tubes are manufactured to ASME SB-338 in annealed condition. According to the standard specification, flattening test and flaring test shall be performed to examine the ductility and potential tiny cracking flaws of the grade 2 titanium tubing. Titanium grade 2 seamless tube ends after flaring tests. 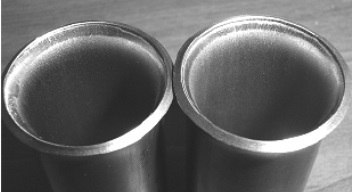 Size of Φ19.05 mm x 1.25 mm (w.t) x 3000 mm; according to ASME SB-338. The titanium gr.2 tube was flared with a coned tool having an angle ≤ 60° until the tube at the mouth of the flare met the requirement of minimum 20% expansion-ratio of inside diameter. No cracking or rupture is visible by unaided eye. The tube ends after flattening test. Size of the grade 2 titanium seamless tube: Φ19.05 mm x 1.25 mm (w.t) x 3000 mm. 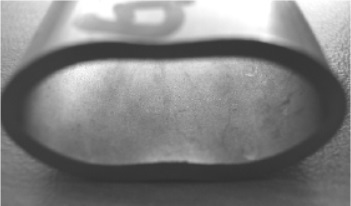 In the flattening test, the grade 2 titanium tube is flattened to a specified height between two parallel plates. The flattening loads shall be applied gradually at room temperature. The specified height is known as the minimum flattened height, H, which is determined by the following equation: H = (1 + e) * t / [e + t / D]. For this occasion, e = 1.78 mm, t (the nominal wall thickness) = 1.25 mm, D (the nominal tube diameter) = 19.05 mm. Thus, we get the H value as 9.78 mm. No cracking is observed by the unaided eye. Standards for flattening test performed on titanium tubes: ISO 8492, EN 10233, GB/T 246, ASTM A370 Annex A2.5.1.1. Standards for flaring test performed on titanium tubes: ISO 8493, EN 10243, GB/T 242, ASTM A370 Annex A.2.5.1.5.